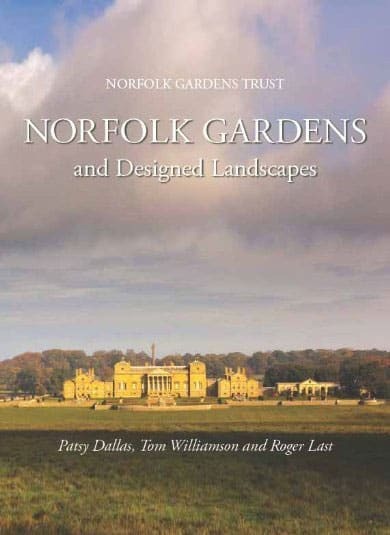 The Norfolk Gardens Trust has published a comprehensive work documenting the history, evolution and architecture of Norfolk’s gardens and designed landscapes as well as their horticulture and design. The research was done utilising both volunteers from the Trust and working with the University of East Anglia. This critically acclaimed book incorporates details of 330 gardens and landscapes and includes over 300 photographs. The book was successfully launched in November 2013 and to date has sold over 2,000 copies and is now on its’ third print run. The book was co-authored and edited by NGT Committee member Roger Last. Copies of the book, now in paperback, can be obtained from major local bookstores such as Jarrolds and via Amazon. 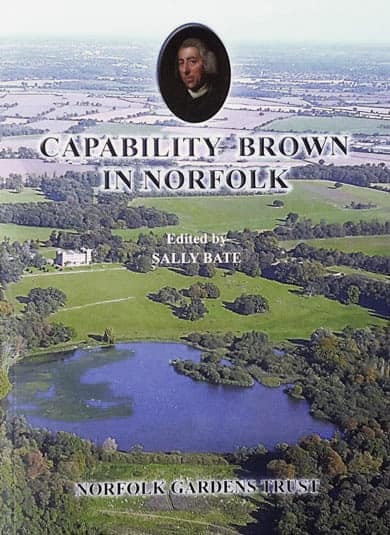 Lancelot ‘Capability’ Brown is often referred to as the father of landscape architecture, and the Norfolk Gardens Trust brings to print for the first time a detailed study of his work in their county. This book is written to coincide with the 300th anniversary of Brown’s birth, and contains over 135 colour maps, paintings and photographs. It will appeal to those interested in these historical Norfolk landscapes and the families who lived there. For Brown’s devotees wishing to learn more about his contribution to the English Landscape Movement in eighteenth-century Norfolk, his surviving plans and a contract are described in full and contemporary and subsequent evidence examined, to determine what design elements and features were built and which of these have survived today. 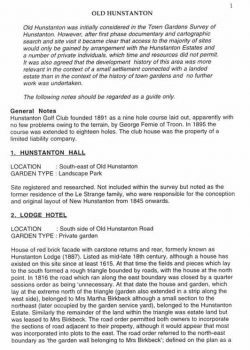 In 2016 the research group began to look at all the sites in Norfolk thought to be associated with Humphry Repton. To commemorate the bi-centenary of Repton’s death in 1818, their findings have been written up to into a richly illustrated, hardback book, published in May 2018. 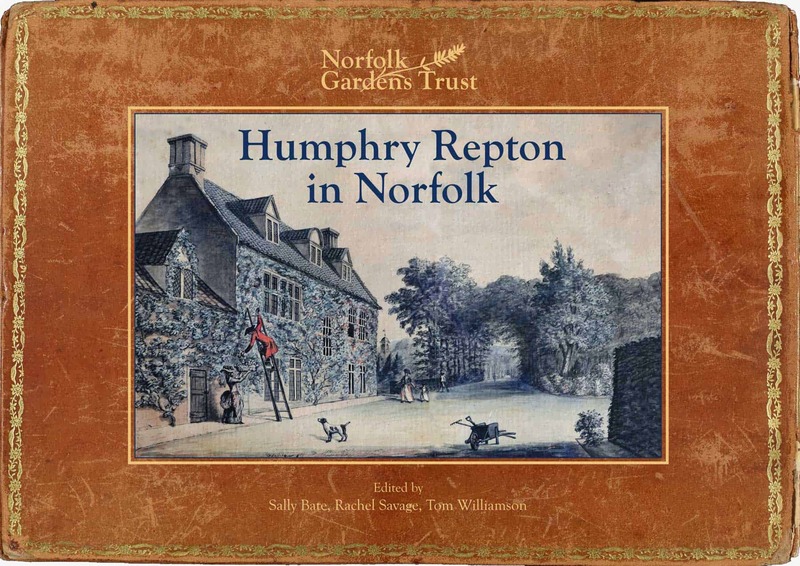 This publication includes all the paintings and sketches from his seven Norfolk Red Books and numerous other examples of Repton’s artwork from public and private collections. For comparison with Repton’s style and methods, the last chapter looks at the work by Loudon, Haverfield and the Kennedys in Norfolk in the same period. The Norfolk Gardens Trust Magazine is a publication produced twice a year and sent free of charge to all members. Copies are also sent to the Association of Gardens Trusts, the British Library, the RHS Lindley Library, the Museum of Garden History, the Norfolk Studies Library and the Norfolk Records Office in Norwich, where they can be viewed on application. 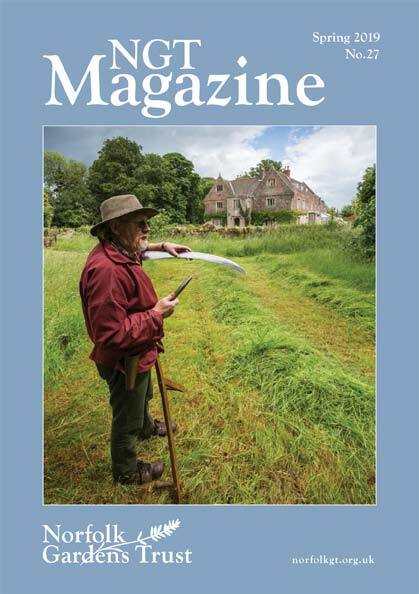 Its range of articles will appeal to anyone interested in gardens and landscape history in Norfolk and beyond. The NGT Magazine is edited by Sue Roe and Clive Lloyd and designed by Karen Roseberry. Please contact sueroe8@icloud.com with suggestions for articles and if you would like your garden to be featured in our Readers’ Gardens section. 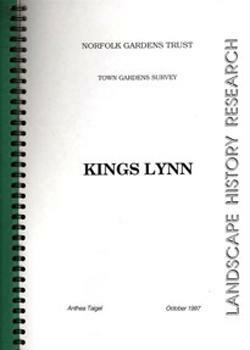 In 1996 the Trust commissioned a survey of the gardens of the towns of Norfolk. 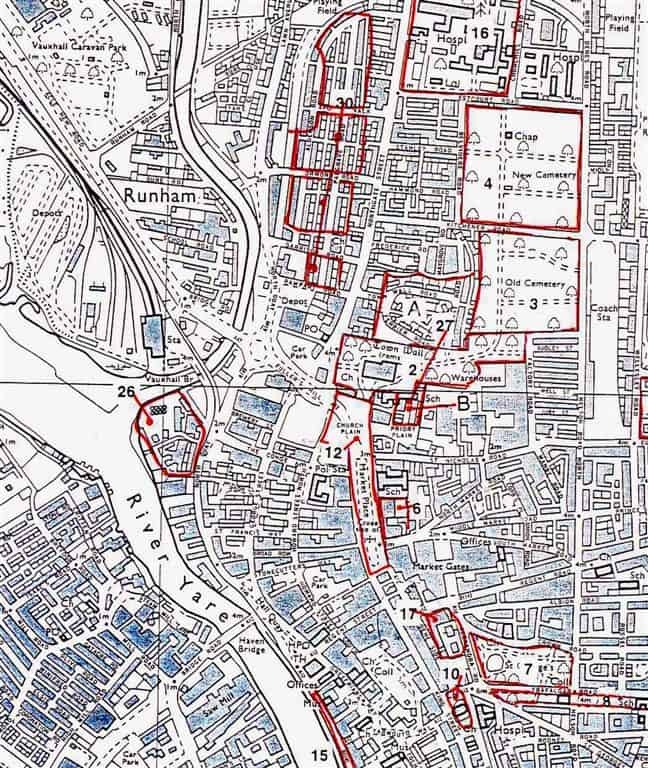 With increasing pressure to develop the land within towns, with more houses, supermarkets, parking lots and roads, clearly the existing gardens within many of them were under threat, and many of the historic gardens clearly defined by the Ordnance Survey maps of the 19th century had already been sub-divided or had disappeared altogether. The Trust wished to have an authoritative record of what had existed and what remained. The survey did not, however cover smaller, mainly 20th century gardens. The emphasis was on historical gardens, mainly pre-20th century, although there were exceptions: the inter-war Norwich Parks, and the many 20th century seaside gardens were included. Anthea Taigel (Landscape History Research), then the gardens inspector for English Heritage for the Eastern region, researched and wrote the reports which were published by the Trust between 1997-99. Twenty one reports were produced covering the towns of Attleborough, Aylsham, Cromer, Diss, Downham Market, East Dereham, Fakenham, Great Yarmouth, Hingham, Holt, Kings Lynn, North Walsham, Norwich, New Hunstanton, Old Hunstanton, Sheringham, Swaffham, Thetford, Watton and Wymondham, plus an additional report on Wymondham Cemetery. 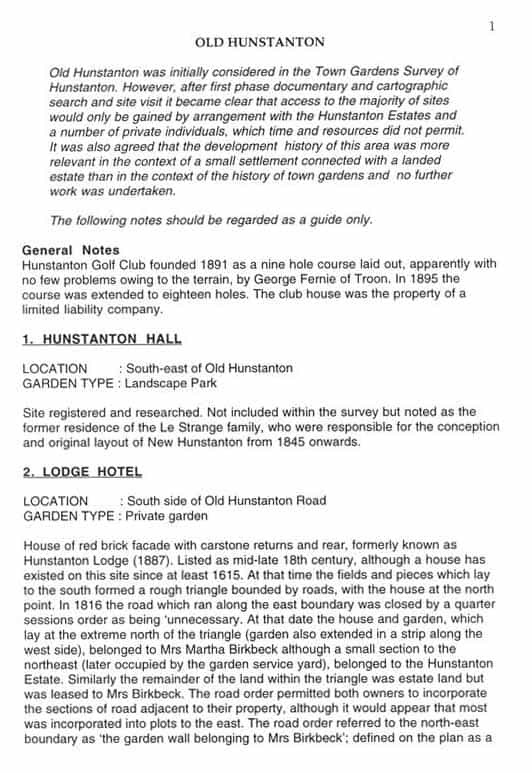 The surveys include a general history and introduction for each town. The number of sites included varies according to the size and importance of the location. 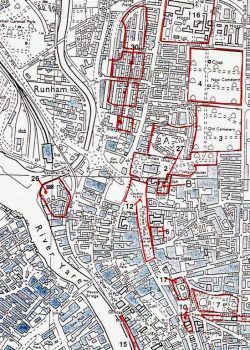 Norwich has thirteen sites considered in detail, and a further fifty three in brief, whereas Holt has three detailed sites and sixteen in outline. The Reports include Ordnance Survey maps, clearly indicating the locations and extent of the gardens, but are not illustrated. 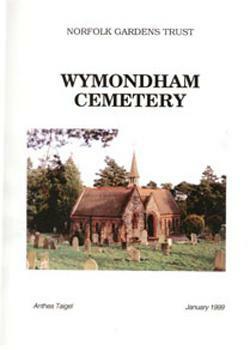 The exception being the report on Wymondham Cemetery which has eight colour pictures and a detailed tree survey. The Town Surveys can be viewed at the Norfolk Heritage Centre, 2nd floor of The Forum, in Norwich, or at the Gressenhall Museum of Norfolk Life. Following the AGM there will be a guided tour of the Salix River and Wetland Nursery. Following the AGM there will be a guided tour of the Salix River and Wetland Nursery, specialists in river erosion control, wetland habitat creation and bioengineering. By kind invitation of Mr & Mrs Simon Broke. The garden was created from scratch between 1987 and the present day and has been planned as a series of interlinking rooms. It sits behind the magnificent Norman Church of St Lawrence. The Alms Houses and the Chapel also open. Teas in aid of the Church. lake and fountains, varied and lush planting. Teas. dominates the west garden. Teas. An illustrated talk by Stephen Smith on the role of professional horticulturists in the design and maintenance of great historic gardens. Teas. An illustrated talk by Jackie Bennett. Was Shakespeare a gardener? This is the question author Jackie Bennett sets out to explore by visiting the gardens William Shakespeare knew as boy and man, in Stratford-upon-Avon and London. Teas. Membership of the Norfolk Gardens Trust offers many benefits. Each year we have at least three gardens to visit, an AGM, a series of talks during the winter months and a magazine published twice yearly. © Copyright 2019 - Norfolk Gardens Trust - All Rights Reserved.